The new Suzuki SX4 S Cross Hatchback is an often overlooked but more-than-competent large family car that’s affordable, fun to drive and fairly cheap to run. It’s no off-roader, but it mucks in when the going gets tough in bad conditions, and offers an understated way to get from A to B.
Suzuki revised the model last year to make it look bolder, and the car now benefits from chunkier alloys and side skirts. Four-wheel-drive is available if you want it, and there is a good selection of engines to choose from, including both diesels and petrols. OSV takes a closer look at what it’s all about with our 2017 Suzuki SX4 S Cross Hatchback review. The Suzuki has surprisingly been transformed into a bit of a driver’s car, thanks to a host of improvements made by the brand. The suspension has been improved, with Suzuki raising the ride height, and the car weighs less than last time. It’s much more fun to drive than before. There is more grip available, it feels nimbler, and while you will notice body roll, the car feels more secure. It’s perhaps not the most composed in this class, but it isn’t far off. On poorer surfaces, the ride might feel jerky, but it will mostly feel supple. The entry-level model can’t be specified with four-wheel-drive, but those that can benefit from more driving modes that help them deal with tricky conditions. The automatic mode will be popular with drivers, while the snow mode will come in useful on those treacherous wintry days. That said, the four-wheel-drive system doesn’t turn the car into a serious off-roader. In terms of the engines, a relatively small 1.0-litre BoosterJet petrol engine kicks things off. It develops 110bhp, can get you from a standstill to 62mph in 11.0 seconds flat, and is our top pick. The fact that the Suzuki is so light helps the engine feel faster than it really is, and while it does make a bit of a noise, it’s a mostly enjoyable one. A quicker 1.4-litre BoosterJet unit is your other petrol option. It comes with four-wheel-drive as standard, develops as much as 148bhp, and can do 0-62 in just 10.2 seconds. The only diesel engine in the range is a 1.6-litre power plant that produces 118bhp. It’s a bit cranky on start-up and doesn’t mind making a noise, but it becomes settled once you’re up and running. It’s got plenty of pulling power to cope with ascents without any issue and is a solid choice. 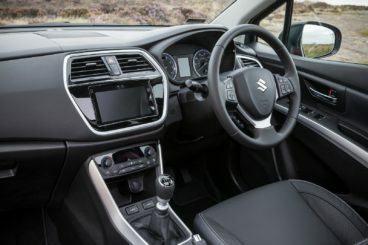 Suzuki overhauled the SX4 S Cross Hatchback’s interior last year, and it now looks much better. The dashboard is simply designed and is easy to operate, and the quality of the materials used is decent. However, there is little to get excited about by the way of aesthetics, and the interior looks bland. The build quality is good and is much improved. With solid plastics and a few soft-touch finishes here and there, it looks like a cabin that’s set to last the test of time. There are cheaper plastics in evidence too, but the fixtures and fittings are adequate for a car of this type. Getting comfortable shouldn’t be an issue for the driver, thanks to lots of steering wheel and seat adjustability. In terms of how practical the car is, it might be narrower and a bit shorter than some rivals, but Suzuki has used its dimensions well. In fact, it feels roomier indoors than most rivals. Headroom is excellent, but does get slightly worse if you go for the SZ5 model which gets the panoramic sunroof. On the flipside, it lets a lot more light into the cabin. There are a number of storage areas in here, but don’t be fooled – some are way too small to be of any use. The glovebox is a reasonable size, but many cubbies, as well as the door pockets, won’t be useful for much except small items. The boot measures 430-litres, which can be increased to 875 by folding the rear seats. That’s a heck of a lot smaller than most of its rivals, despite the seats folding flat. The low loading lip is an advantage, but there are no remote release handles. There are three trim levels available, starting with the SZ4 model that gets 16” alloys, USB connectivity, split-folding rear seats, manual air conditioning, cruise control and electric windows as part of its standard kit. The SZ-T model adds 17” alloys, LED headlights, a reversing camera, a DAB radio, Bluetooth and sat nav. The SZ5 trim rounds things off with rear parking sensors and a camera, LED daytime running lights, a panoramic sunroof, and heated leather seats. Is the Suzuki SX4 S Cross Hatchback safe? It scored 5/5 when crash-tested by Euro NCAP, and its safety kit includes airbags, side-impact protection beams, electronic stability control, anti-lock brakes, hill-hold assistance, a tyre-pressure monitoring system and ISOFIX child-seat mount points. The SZ5 model also benefits from Radar Brake Support which warns the driver if a potential collision is on the horizon. Prices for the new car start out from £16,999 and rise to £25,749. If you prefer to lease, you can pick up a deal from £245 + VAT per month. For more information on our leasing deals, check out our page here. In terms of its running costs, the SX4 S Cross is reasonably frugal. All models emit under 130g/km of CO2, and they all come with stop-start tech. The two-wheel-drive 1.6-litre diesel engine is the cheapest to run of the whole range, and averages 68.9mpg while emitting just 106g/km of CO2. Add four-wheel-drive, and those figures change to 64.2mpg and 114g/km. The 1.0-litre BoosterJet engine is the cheapest petrol option that returns 56.5mpg if fitted with two-wheel-drive, and 53.3mpg if fitted with four-wheel-drive. It’ll be hard to find many cars of this type that can return as much as 68mpg economy. For a car that looks rather hefty, the SX4 S Cross Hatchback is actually fairly light, and this helps it on the road, where it’s responsive and agile. The entry-level model is the only one that misses out on 4WD, and it’s a system that’s well worth adding. It’s strong, grippy and adds more composure. Compared to more distinctive rivals – especially the Nissan Qashqai – the Suzuki isn’t the most memorable to look at. The cabin is well-built, and there are some nice touches here and there. But cheaper plastics let the side down. Let’s see how the car fares against its rivals in the comparison section of our 2017 Suzuki SX4 S Cross Hatchback review. The new Mitsubishi ASX is small SUV that’s practical and fairly priced. Considering the amount of standard kit that’s on offer, it offers a good amount of value for money. If you need a rugged family car that protects you all from blows dished out by broken roads, the Mitsubishi is a solid option. On the flipside, it isn’t fun to drive. The steering is imprecise, and there is a fair amount of body roll. That said, this is a super comfortable car that, thanks to its compact size, is easy to manoeuvre. In terms of its engines, a 1.6-litre unit is the sole petrol choice. It’s front-wheel-drive only, develops 115bhp, and does 0-62 in 11.5 seconds before maxing out at 114mph. It’s quiet – but not as quiet as the diesels. Indeed, the 1.6-litre diesel is our top pick. It produces 112bhp and delivers most of it at low speeds, meaning you don’t need to work it too hard. It’s available with either two or four-wheel drive, with the former able to complete the 0-62 dash in 11.5 seconds, and the latter 11.8 seconds. The bigger 2.2-litre diesel is very niche. It’s available with a manual ‘box and has plenty of power, but it’s slow and seems unnecessary. In terms of running costs, the petrol returns an erasable 48.7mpg economy and emits 135g/km of CO2. The 1.6-litre diesel returns 61.4mpg with two-wheel-drive, but that figure nosedives if you opt for four-wheel-drive. However, you should still be able to average over 50mpg. The bigger 2.2-litre diesel, meanwhile, returns 48.67mpg economy. Inside, the biggest problem you’ll experience is poor insulation. Tyre, road and wind noise are met with little resistance, while diesel clatter will be an issue. The soft suspension boosts comfort, at least. The dash is swathed in dark plastics, which creates an unnerving, gloomy atmosphere. Pick a model that comes with tinted glass, and it’s even darker. The design of the dashboard is simple and tasteful, and the controls are easy to find and use. 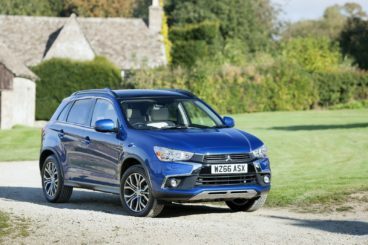 Is the Mitsubishi ASX practical? Its interior is certainly large enough to accommodate four adults, despite the car’s compact dimensions. A huge glovebox and a pair of central cubbies will help you keep the cabin clean and tidy, while the high roof provides plenty of headroom. The boot, meanwhile, measures 442-litres, which can be extended to 1,193 by folding the rear seats. The Nissan Qashqai has been one of the best-selling family cars in Britain since it arrived here in 2006. Fast-forward over ten years, and Nissan has double downed on the formula that made it such a success the first time around. On the road, the Qashqai is up for some fun. There is minimal body lean, and the well-weighted steering doesn’t twitch as much as cars of this type are prone to doing. The suspension has also been sharpened up, and the car is now a much more composed version of what it used to be. In terms of its engines, the 1.5-litre diesel engine takes 11.9 seconds to complete the 0-62 dash. That doesn’t exactly make it look fast, but it’s got enough pulling power to feel good on the motorway. The bigger 1.6-litre diesel will cost more to run, but if you need more speed it can do 0-62 in less than 10.0 seconds. It’s four-wheel-drive and is available with the brands Xtronic auto transmission. There are also two petrol engines available, including a 113bhp 1.2-litre engine that takes 10.6 seconds to get you from rest to 62mph. It’s turbocharged, which helps to keep costs down, but that also means you’ll need to work it harder. A 1.6-litre DIG-T petrol unit rounds the range off. It’s fast, and can do 0-62 in 8.9 seconds, but its returns of the 48.7mpg economy might put some buyers off. The smaller petrol averages 50.4mpg, while the most frugal engine in the range is the 1.5-litre diesel, which returns 74.3mpg and emits just 99g/km of CO2. Inside, the Nissan Qashqai boasts the best cabin in this review. The layout is attractive, the materials used are better than last time (there are more soft-touch plastics), and build quality is good. Everything is easy to find too, while insulation is also excellent. Good visibility is ensured by the raised ride height, and the seats are available in various cloth trims and are nice and supportive. 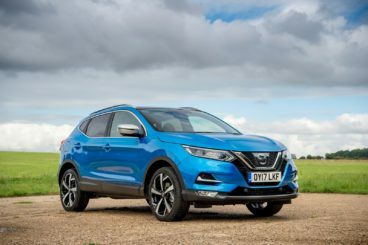 Is the Nissan Qashqai practical? It’s not so big that it can’t fit into your garage, but it is fairly big inside. Leg and headroom should be just fine for all your passengers, parking sensors are optional, as are front, side and rear colour parking cameras – but there is now no longer the option of seven seats. The boot, meanwhile, measures 430-litres. It comes with a false floor, and does without a load lip. 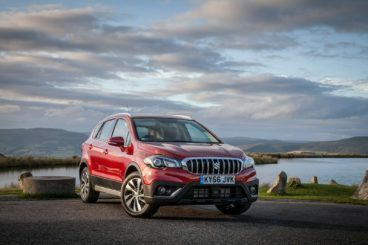 Is the new SX4 S Cross more memorable than last time? Yes and no. It’s certainly better than last time, with more soft-touch plastics, a strong 4WD system and improved drivability. But it loses out in the styling stakes and continues about its business in an understated way. If this sounds like just the ticket for you, the new Suzuki SX4 S Cross Hatchback is worth a shot.